by Kathleen S Smith. Rowman & Littlefield, 2006. No matter what issues or conflict may befall a congregation, worship goes on, week in, week out. Kathleen Smith, the Director of Continuing Education for the Calvin Institute of Christian Worship and Calvin Theological Seminary, offers guidance for worship planners in congregations going through difficulty. The book is part of the Vital Worship, Healthy Congregations series, produced by the Alban Institute and the Calvin Institute. 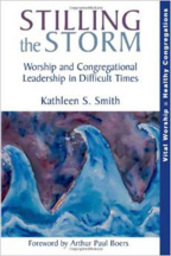 Using representative stories, Smith identifies the characteristics and dynamics of a congregation in crisis, one in transition, and one in conflict. For each of these categories of congregational challenge, as well as for the overall theme of congregations in difficulty, she identifies key considerations for worship life. In addition to discussion of congregational emotional and communication dynamics, each section offers practical worship resources (prayers, scripture passages and liturgy suggestions). This resource may be best suited to traditional worship settings; clergy and other worship planners in congregations in conflict, those in transition, and those recovering from a tragedy, will find this a rich resource.